Originally the ‘Chrisoula K’ was launched in January 1952 in Lübeck, Germany, as the ‘Dora Oldendorff’. Later she became the ‘Anna B’ in 1979 and eventually in 1979 she became the ‘Chrisoula K’. She was equipped with a 2-stroke 9-cylinder diesel engine which gave her around 2700 HK and a top speed of 12 knots. Not much is known about here tasks before here loss. In august 1981, Italy, the ‘Chrisoula K’ was loaded with patio tiles for Jeddah, Saudi-Arabia. Late in the afternoon the ship departed direction ‘Port Said’. After the administration pilot etc the ship finally sailed to Suez. Again, just like the ‘Kimon M’, a ship with an overfatigued captain who left nothing to others, a ship sailed to the street of Gobar at the end of the Suez Canal. At this point the sea lanes widened and, if not for the presence of the Sha’Abu Nuhas reef, anyone could sail a ship almost blindfolded. Like others before him (and since!) this ship’s master relaxed a little bit too soon. 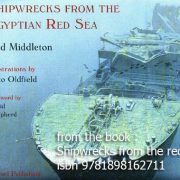 He left the bridge and just when he stepped into his bed, on 31 august 1981 the ship ran onto the Sha’ab Abu Nuhas reef. 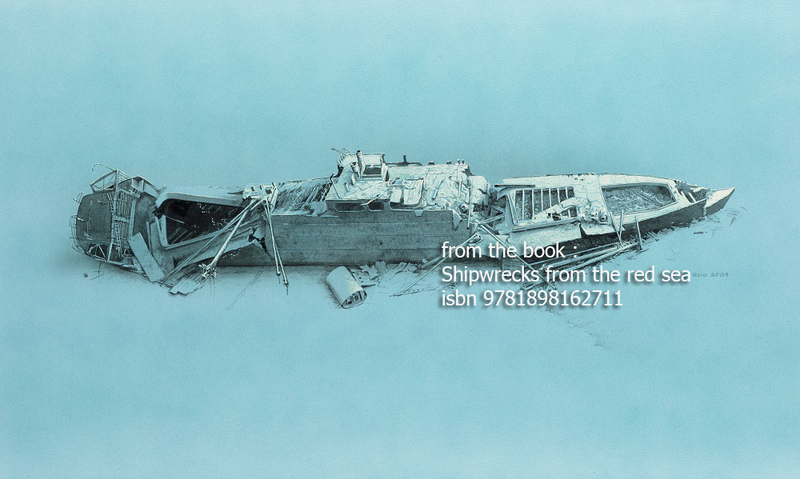 Heavily damaged the stern sank almost immediately, pulling the rest of the ship down with it. The bow however was solid stuck on the reef and broke. Still the bow can be seen on top of the reef. The stern of the ‘Chrisoula K’ is the deepest point, zo we start the dive at that point. Descending we can see the railing beautifully overgrown with hard and soft corals. At the stern we find a door leading to wat were the crew quarters. Behind the door we find an open space. The wooden walls of course are all long gone. In the middle you see the stairwell leading to a floor down. There we find another stairwell, but at the end you see a small corridor and nothing more. At the rear side of this deck there’s a crack which you can use to swim outside. While leaving the wreck you can look down and see the spare propeller of the ‘Chrisoula K’. Following the deck at port side the decade of the ship is good to observe. Part of the hull is collapsed to the side. In the cargo hold, we see the tiles destined for Jeddah. If we dive just below the deck at starboard side to the front, we can enter the hull to a small corridor. There you find some other rooms midship. The steel frames are still standing. We find a door which we can enter. No worries, there’s a lot of places to leave the room. To the portside of this room the engine room is located. However, the top is latterly collapsed so there’s a lot of debris. Due to the collapse however, in the front there’s a new and easy entrance to the lower part of the engine room. Looking at the front you see a stairway which leads you down into the actual engine room below the debris. You enter this room just next to the main engine. You also see the big generators and the electrical control panels. From the stairs we turn right passing the engine and entering the pump room. Swimming further we reach the other side of the engine and over the propeller shaft. To the left you see a small door next to the shaft. Looking into the door you see the shaft tunnel. This is to small to enter. We end this tour of the engine room looking at the generators en control panels and following the stairs leaving the engine room. Looking at the aft, we see a room with a big stove, the kitchen. To the left there’s a big room, the messroom. Looking to the right we see a door and behind it we find the workshop. We see a large pillar drill machine and to the right a large chucking lathe. Also, a small storage room for nuts and bolts can be found. Also, a lot of spare parts although the most interesting ones are gone. Leaving the workshop at front we enter the front cargo hold, again stuffed with tiles. Often you can find turtles here but also murene eels are not rare. Still you can see the steel capitals EO on the chimney at starboard side in the sand. Those are the first capitals of ‘Egon Oldendorf’, the founder of the company who originally build the Chrisoula K.
If we ascend the hull and enter the ship again we arrive at the mess room and we van visit the kitchen Even more up we find the bridge although most of it Is gone. At that level the depth is around 8 meters so nice to do our safety stop and finish the dive. Remember that is your zodiac is not arrived yet, it is better to stay at around 3 meters to wait for it. Normally there are some waves and is very unpleasant waiting in the waves. On the wreck itself, due to the relatively small depth om most parts, we will find small fish, like clown fish and alike. As mentioned in ‘Diving the Chrisoula K’ you can find Murene eels and turtles. At starboard size, next to the chimney, there’s a famous eel garden. Those eels will pop up from the sand but will disappear as soon as any danger comes near.